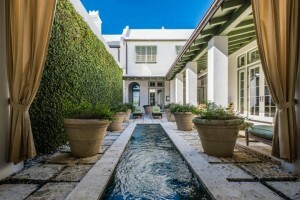 Beautiful courtyard home for sale in Alys Beach, FL. Located just west of Rosemary Beach and designed by architect Gary Justiss, this courtyard home features 3 bedrooms, 3 1/2 bathrooms, an open floor plan, dipping pool, custom cabinets, stained oak flooring, a fireplace, rooftop terrace, and 2,187 sq. ft. of heated and cooled space. Close to Caliza Pool, the Amphitheater, Fonville Press, and playground, this home is just a short bike ride away from the private beach access and Owner’s Perch. Call us today to get a tour of this or any Alys Beach home for sale. Contact us at The Beach Group at 850.231.9007 for more information on Alys Beach real estate.